Occulture: The Dark Arts Gallery Exhibition in New Zealand – Zero Equals Two! “Art and the occult have always been intertwined. They draw powers, rituals and symbols from each other in their efforts to re-enchant the world and redefine human experience. “Throughout history, occult practices have been shunned, banned, and driven underground. Yet, certain moments have been open to their alternative possibilities. According to academic Christopher Partridge we are witnessing the emergence of a shared ‘Occulture’. Esoteric and occult ideas have permeated wider consciousness and reshaped the spirit of our age. “This show explores contemporary art’s role in the process of occultation (a term first used by Andre Breton in his 1929 Surrealist Manifesto). It brings together New Zealand and international artists who push the symbolic, formal and material languages of esoteric or occult traditions into new forms. Australian artist Mikala Dwyer casts a spell in the form of a wall painting. Dane Mitchell’s silk banners are printed with hand gestures that activate magical thinking and open up possibilities for astral perception. 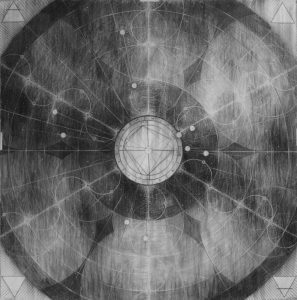 Taiwanese artist Yin-Ju Chen’s charcoal Liquidation Maps link atrocities in Asia to specific astrological permutations. Each invokes invisible energies and forces to charge the gallery space. “These and other contemporary artists—working across drawing, painting, sculpture, film, sound, printmaking and photography—are brought into conversation with key historical figures of the occult tradition. At the heart of the exhibition is a suite of ‘nightmare paintings’ by English occultist, magician and poet Aleister Crowley, and the trance-induced work of his Antipodean devotee Rosaleen Norton. Crowley’s paintings were made in Sicily in the early 1920s, as he was establishing his Abbey of Thelema. They were part of his attempt to integrate art into his magical theory. Norton was born ‘during a thunderstorm’ in Dunedin in 1917. She moved to Sydney, where she became known as ‘the Witch of King’s Cross’ and was persecuted for her transgressive behaviour and for her mystical art works summoning pagan entities. This is the first time either have been exhibited in New Zealand.